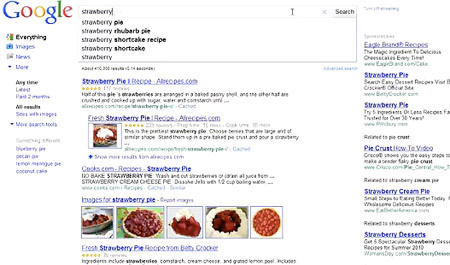 "Google Instant" is a new search enhancement that shows results as you type. We are pushing the limits of our technology and infrastructure to help you get better search results, faster. Our key technical insight was that people type slowly, but read quickly, typically taking 300 milliseconds between keystrokes, but only 30 milliseconds (a tenth of the time!) to glance at another part of the page. This means that you can scan a results page while you type. 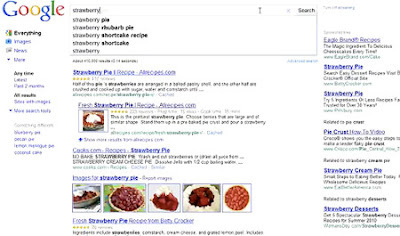 The most obvious change is that you get to the right content much faster than before because you don’t have to finish typing your full search term, or even press “search.” Another shift is that seeing results as you type helps you formulate a better search term by providing instant feedback. You can now adapt your search on the fly until the results match exactly what you want. In time, we may wonder how search ever worked in any other way.